Will everybody get a brown bin? What about our regular trash bins? Will it smell? The arrival of this new guy in our households can bring about some questions or concerns. Even though many citizens have been anxiously awaiting the new guy’s arrival, many details still need to be addressed. You’ll find answers to your questions in this section in order to make the brown bin’s integration into your routine is as easy as possible. When will the brown bin collection begin? The brown bin collection will begin in September of 2018. Consult the calendar for the date of the first collection of organic materials. Who is the owner of the brown bin? 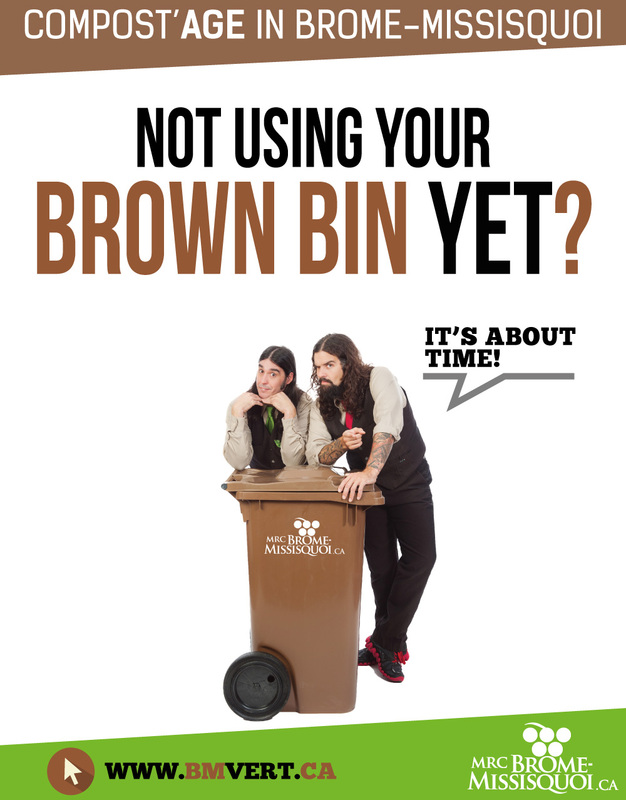 The brown bin is the propriety of each municipality. Its a Ministry' obligation for award a grant to the RIGMRBM. Why such a big bin? Or, could I have a second bin? The 240-litre bin is the minimal size of mechanical collections completed by municipal contractors (the truck’s gripping claws can’t grip a smaller bin). Also, the 240-litre bins are more resistant and won’t tip over as easily. Its bigger capacity will be able to carry all kinds of green waste. If you find that you don’t have enough space in your bin, contact your municipality to find out if you can get a second one. We already compost for ourselves. Why would we need a brown bin? The brown bin completes your domestic composting by allowing you to add several other waste materials (meats, fish, fatty, sweet and dairy products, etc.). So, for a household already composting, it was evaluated that about 2 kg of organic materials (table scraps, salads, meat, animal products, etc.) would still be sent to a brown bin. So, for about ten homes, 100 kg per year or the equivalent of a ton would be collected. Small weekly amounts very quickly add up to a significant tonnage. How can we avoid flies and odours in our bin as well as in our kitchen? Come back and visit our “Tips and Tricks” section next summer to find easy ways to avoid these annoyances. What is important to remember is to take out your bin on each collection day, even if it contains very little, especially during the summer months. Why are plastic or compostable/biodegradable bags not accepted in brown bin? The composting platform of Cowansville’s R.I.G.M.R.B.M. is an open site and will not take materials packed in such bags because of the odours, which are absolutely not the same when the bags are opened. This is why the authorization certificate granted by the Ministry of the Environment (MDDELCC) doesn’t allow them to accept materials placed in “plastic” bags. More importantly, the decomposition cycle of compostable, plastic-type bags is much longer than that of other materials. Consequently, at the end of the materials’ cycle, pieces of these “biodegradable” bags shred and get mixed in with the finished product, which is not recommended. Afterwards, it becomes difficult, during the screening process, to take out the unwanted material. The same rule applies to plastic-type, compostable dishware, which is not accepted either. What should we do if we’re not home for an extended period of time? Think of putting all your organic waste in the bin the week before you leave, then, clean it and leave it empty until you return (If need be, you can always place the remaining waste in your freezer). Odours and fly problems tend to occur in the summer if the bin is exposed to heat for long periods of time without being emptied. What should we do if our trash bin is overflowing or smells bad? Your trash bin should not contain a lot of waste because the brown bin will be filled with your household organic materials (more than half of your trash) and your blue bin contains all your recycling. As for the odour problem, these can come from any organic materials left in your trash; In fact, your trash bin should emit very little odours or none at all. Diapers are also an issue for concern; The consensus with different cities that have made the move is that a diaper doesn’t smell any worse, it’s always bad! What will you do with the collected materials? Collected materials will be transported to the composting platform of the Régie intermunicipale de gestion des matières résiduelles de Brome-Missisquoi (RIGMRBM, Brome-Missisquoi’s inter-municipal board for waste management) located in Cowansville. Brown bin materials will be added to wood and other green waste, then piled outside in windrows. These windrows will be turned regularly which will accelerate the decomposition process and allow the material to reach a high enough temperature to kill seeds, weeds and pathogens. Finally, as the compost matures, it will be sieved.